Genesis 10:19 The border of the Canaanites was from Sidon, as you go toward Gerar, to Gaza; as you go toward Sodom, Gomorrah, Admah, and Zeboiim, to Lasha. Genesis 11:31 Terah took Abram his son, Lot the son of Haran, his son's son, and Sarai his daughter-in-law, his son Abram's wife. They went forth from Ur of the Chaldees, to go into the land of Canaan. They came to Haran and lived there. Genesis 12:5 Abram took Sarai his wife, Lot his brother's son, all their substance that they had gathered, and the souls whom they had gotten in Haran, and they went forth to go into the land of Canaan. Into the land of Canaan they came. Genesis 13:12 Abram lived in the land of Canaan, and Lot lived in the cities of the plain, and moved his tent as far as Sodom. Genesis 16:3 Sarai, Abram's wife, took Hagar the Egyptian, her handmaid, after Abram had lived ten years in the land of Canaan, and gave her to Abram her husband to be his wife. Genesis 17:8 I will give to you, and to your seed after you, the land where you are traveling, all the land of Canaan, for an everlasting possession. I will be their God." Genesis 31:18 and he took away all his livestock, and all his possessions which he had gathered, including the livestock which he had gained in Paddan Aram, to go to Isaac his father, to the land of Canaan. Genesis 33:18 Jacob came in peace to the city of Shechem, which is in the land of Canaan, when he came from Paddan Aram; and encamped before the city. Genesis 35:6 So Jacob came to Luz (that is, Bethel), which is in the land of Canaan, he and all the people who were with him. Genesis 36:5 Oholibamah bore Jeush, Jalam, and Korah. These are the sons of Esau, who were born to him in the land of Canaan. Genesis 36:6 Esau took his wives, his sons, his daughters, and all the members of his household, with his livestock, all his animals, and all his possessions, which he had gathered in the land of Canaan, and went into a land away from his brother Jacob. Genesis 37:1 Jacob lived in the land of his father's travels, in the land of Canaan. Genesis 42:5 The sons of Israel came to buy among those who came, for the famine was in the land of Canaan. Genesis 44:8 Behold, the money, which we found in our sacks' mouths, we brought again to you out of the land of Canaan. How then should we steal silver or gold out of your lord's house? Genesis 45:17 Pharaoh said to Joseph, "Tell your brothers,'Do this. Load your animals, and go, travel to the land of Canaan. Genesis 45:25 They went up out of Egypt, and came into the land of Canaan, to Jacob their father. Genesis 45:26 They told him, saying, "Joseph is still alive, and he is ruler over all the land of Egypt." His heart fainted, for he didn't believe them. Genesis 46:12 The sons of Judah: Er, Onan, Shelah, Perez, and Zerah; but Er and Onan died in the land of Canaan. The sons of Perez were Hezron and Hamul. Genesis 46:31 Joseph said to his brothers, and to his father's house, "I will go up, and speak with Pharaoh, and will tell him,'My brothers, and my father's house, who were in the land of Canaan, have come to me. Genesis 47:1 Then Joseph went in and told Pharaoh, and said, "My father and my brothers, with their flocks, their herds, and all that they own, have come out of the land of Canaan; and behold, they are in the land of Goshen." Genesis 47:4 They said to Pharaoh, "We have come to live as foreigners in the land, for there is no pasture for your servants' flocks. For the famine is severe in the land of Canaan. Now therefore, please let your servants dwell in the land of Goshen." Genesis 47:13 There was no bread in all the land; for the famine was very severe, so that the land of Egypt and the land of Canaan fainted by reason of the famine. Genesis 47:14 Joseph gathered up all the money that was found in the land of Egypt, and in the land of Canaan, for the grain which they bought: and Joseph brought the money into Pharaoh's house. Genesis 47:15 When the money was all spent in the land of Egypt, and in the land of Canaan, all the Egyptians came to Joseph, and said, "Give us bread, for why should we die in your presence? For our money fails." Genesis 47:16 Joseph said, "Give me your livestock; and I will give you food for your livestock, if your money is gone." Genesis 49:30 in the cave that is in the field of Machpelah, which is before Mamre, in the land of Canaan, which Abraham bought with the field from Ephron the Hittite as a burial place. Genesis 50:13 for his sons carried him into the land of Canaan, and buried him in the cave of the field of Machpelah, which Abraham bought with the field, for a possession of a burial site, from Ephron the Hittite, before Mamre. Exodus 6:4 I have also established my covenant with them, to give them the land of Canaan, the land of their travels, in which they lived as aliens. Exodus 16:35 The children of Israel ate the manna forty years, until they came to an inhabited land. They ate the manna until they came to the borders of the land of Canaan. Leviticus 18:3 You shall not do as they do in the land of Egypt, where you lived: and you shall not do as they do in the land of Canaan, where I am bringing you; neither shall you walk in their statutes. Leviticus 25:38 I am Yahweh your God, who brought you forth out of the land of Egypt, to give you the land of Canaan, and to be your God. Numbers 13:2 "Send men, that they may spy out the land of Canaan, which I give to the children of Israel. Of every tribe of their fathers, you shall send a man, every one a prince among them." Numbers 26:19 The sons of Judah: Er and Onan; and Er and Onan died in the land of Canaan. Numbers 32:30 but if they will not pass over with you armed, they shall have possessions among you in the land of Canaan." Numbers 32:32 We will pass over armed before Yahweh into the land of Canaan, and the possession of our inheritance shall remain with us beyond the Jordan." Numbers 33:40 The Canaanite, the king of Arad, who lived in the South in the land of Canaan, heard of the coming of the children of Israel. Numbers 34:29 These are they whom Yahweh commanded to divide the inheritance to the children of Israel in the land of Canaan. Numbers 35:14 You shall give three cities beyond the Jordan, and you shall give three cities in the land of Canaan; they shall be cities of refuge. Joshua 5:12 The manna ceased on the next day, after they had eaten of the produce of the land. The children of Israel didn't have manna any more; but they ate of the fruit of the land of Canaan that year. Joshua 21:2 They spoke to them at Shiloh in the land of Canaan, saying, "Yahweh commanded Moses to give us cities to dwell in, with their suburbs for our livestock." Joshua 22:9 The children of Reuben and the children of Gad and the half-tribe of Manasseh returned, and departed from the children of Israel out of Shiloh, which is in the land of Canaan, to go to the land of Gilead, to the land of their possession, which they owned, according to the commandment of Yahweh by Moses. Joshua 22:10 When they came to the region about the Jordan, that is in the land of Canaan, the children of Reuben and the children of Gad and the half-tribe of Manasseh built there an altar by the Jordan, a great altar to look at. Joshua 22:11 The children of Israel heard this, "Behold, the children of Reuben and the children of Gad and the half-tribe of Manasseh have built an altar in the forefront of the land of Canaan, in the region about the Jordan, on the side that pertains to the children of Israel." Joshua 22:32 Phinehas the son of Eleazar the priest, and the princes, returned from the children of Reuben, and from the children of Gad, out of the land of Gilead, to the land of Canaan, to the children of Israel, and brought them word again. Joshua 24:3 I took your father Abraham from beyond the River, and led him throughout all the land of Canaan, and multiplied his seed, and gave him Isaac. Judges 4:2 Yahweh sold them into the hand of Jabin king of Canaan, who reigned in Hazor; the captain of whose army was Sisera, who lived in Harosheth of the Gentiles. Judges 4:24 The hand of the children of Israel prevailed more and more against Jabin the king of Canaan, until they had destroyed Jabin king of Canaan. Judges 5:19 "The kings came and fought, then the kings of Canaan fought at Taanach by the waters of Megiddo. They took no plunder of silver. Judges 21:12 They found among the inhabitants of Jabesh Gilead four hundred young virgins, who had not known man by lying with him; and they brought them to the camp to Shiloh, which is in the land of Canaan. 1 Chronicles 16:18 saying, "I will give you the land of Canaan, The lot of your inheritance,"
Isaiah 19:18 In that day, there will be five cities in the land of Egypt that speak the language of Canaan, and swear to Yahweh of Armies. One will be called "The city of destruction." Isaiah 23:11 He has stretched out his hand over the sea. He has shaken the kingdoms. Yahweh has ordered the destruction of Canaan's strongholds. Zephaniah 2:5 Woe to the inhabitants of the sea coast, the nation of the Cherethites! The word of Yahweh is against you, Canaan, the land of the Philistines. I will destroy you, that there will be no inhabitant. Acts 7:11 Now a famine came over all the land of Egypt and Canaan, and great affliction. Our fathers found no food. Acts 13:19 When he had destroyed seven nations in the land of Canaan, he gave them their land for an inheritance, for about four hundred fifty years. Canaan is stated in Genesis 10:6 to have been a son of Ham and brother of Mizraim, or Egypt. This indicates the Mosaic period when the conquerors of the XVIIIth and XIXth Egyptian Dynasties made Canaan for a time a province of the Egyptian empire. Under the Pharaoh Meneptah, at the time of the Exodus, it ceased to be connected with Egypt, and the Egyptian garrisons in the South of the country were expelled by the Philistines, who probably made themselves masters of the larger portion of it, thus causing the name of Philistia or Palestine to become synonymous with that of Canaan (see Zephaniah 2:5). In the Tell el-Amarna Letters, Canaan is written Kinakhna and Kinakhkhi. The latter form corresponds with the Greek (Chna), a name given to Phoenicia (Hecat. Fragments 254; Eusebius, praep. Ev., i0.1; ix.17). In Numbers 13:29 the Canaanites are described as dwelling "by the sea, and along by the side of the Jordan," i.e. in the lowlands of Palestine. The name was confined to the country West of the Jordan (Numbers 33:51 Joshua 22:9), and was especially applied to Phoenicia (Isaiah 23:11; compare Matthew 15:22). Hence, Sidon is called the "firstborn" of Canaan (Genesis 10:15, though compare Judges 3:3), and the Septuagint translates "Canaanites" by "Phoenicians" and "Canaan" by the "land of the Phoenicians" (Exodus 16:35 Joshua 5:12). Kinakhkhi is used in the same restricted sense in the Tell el-Amarna Letters, but it is also extended so as to include Palestine generally. On the other hand, on the Egyptian monuments Seti I calls a town in the extreme South of Palestine "the city of Pa-Kana'na" or "the Canaan," which Conder identifies with the modern Khurbet Kenan near Hebron. As in the Tell el-Amarna Letters, so in the Old Testament, Canaan is used in an extended sense to denote the whole of Palestine West of the Jordan (Genesis 12:5; Genesis 23:2, 19; 28:01:00; 31:18:00; 35:06:00; Genesis 36:2; Genesis 37:1; 48:07:00; Exodus 15:15 Numbers 13:2 Joshua 14:1; Joshua 21:2 Psalm 135:11). Thus, Jerusalem which had Amorite and Hittite founders is stated to be of "the land of the Canaanite" (Ezekiel 16:3), and Isaiah 19:18 terms Hebrew, which was shared by the Israelites with the Phoenicians and, apparently, also the Amorites, "the language of Caaan." Jabin is called "the king of Canaan" in Judges 4:2, 23, 24; but whether the name is employed here in a restricted or extended sense is uncertain. As the Phoenicians were famous as traders, it has been supposed that the name "Canaanite" is a synonym of "merchant" in certain passages of the Old Testament. The pursuit of trade, however, was characteristic only of the maritime cities of Phoenicia, not of the Canaanitish towns conquered the Israelites. In Isaiah 23:11 we should translate "Canaan" (as the Septuagint) instead of "merchant city" (the King James Version); in Hosea 12:7 (8), "as, for Canaan" (Septuagint), instead of "he is a merchant" (the King James Version); in Ze 1:11, "people of Canaan" (Septuagint), instead of "merchant people" (the King James Version); on the other hand, "Canaanite" seems to have acquired the sense of "merchant," as "Chaldean" did of "astrologer," in Isaiah 23:8, and Proverbs 3:1:24, though probably not in Zechariah 14:21, and Job 41:6 (Hebrew 40:30). Much light has been thrown upon the history of Canaan prior to the Israelite occupation by recent excavation, supplemented by the monuments of Babylonia and Egypt. The Palestine Exploration led the way by its excavations in 1890-92 at Tell el-Hesy, which turned out to be the site of Lachish, first under Professor Flinders Petrie and then under Dr. Bliss. Professor Petrie laid the foundations of Palestine archaeology by fixing the chronological sequence of the Lachish pottery, and tracing the remains of six successive cities, the fourth of which was that founded by the Israelites. Between it and the preceding city was a layer of ashes, marking the period when the town lay desolate and uninhabited. The excavations at Lachish were followed by others at Tell es-Safi, the supposed site of Gath; at Tell Sandahanna, the ancient Marissa, a mile South of Bet Jibrin, where interesting relics of the Greek period were found, and at Jerusalem, where an attempt was made to trace the city walls. Next to Lachish, the most fruitful excavations have been at Gezer, which has been explored by Mr. Macalister with scientific thoroughness and skill, and where a large necropolis has been discovered as well as the remains of seven successive settlements, the last of which comes down to the Seleucid era, the third corresponding with the first settlement at Lachish. The two first settlements go back to the neolithic age. With the third the Semitic or "Amorite" period of Canaan begins; bronze makes its appearance; high-places formed of monoliths are erected, and inhumation of the dead is introduced, while the cities are surrounded with great walls of stone. While Mr. Macalister has been working at Gezer, German and Austrian expeditions under Dr. Schumacher have been excavating at Tell em-Mutesellim, the site of Megiddo, and under Dr. Sellin first at Tell Taanak, the ancient Taanach, and then at Jericho. At Taanach cuneiform tablets of the Mosaic age were found in the house of the governor of the town; at Samaria and Gezer cuneiform tablets have also been found, but they belong to the late Assyrian and Babylonian periods. At Jericho, on the fiat roof of a house adjoining the wall of the Canaanitish city, destroyed by the Israelites, a number of clay tablets were discovered laid out to dry before being inscribed with cuneiform characters. Before the letters were written and dispatched, however, the town, it seems, was captured and burnt. An American expedition, under Dr. Reisner, is now exploring Sebastiyeh (Samaria), where the ruins of Ahab's palace, with early Hebrew inscriptions, have been brought to light, as well as a great city wall built in the age of Nebuchadrezzar. The history of Canaan begins with the paleolithic age, paleolithic implements having been found in the lowlands. Our first knowledge of its population dates from the neolithic period. The neolithic inhabitants of Gezer were of short stature (about 5 ft. 4 inches in height), and lived in caves-at least in the time of the first prehistoric settlement-and burned their dead. Their sacred place was a double cave with which cup-marks in the rock were connected, and their pottery was rude; some of it was ornamented with streaks of red or black on a yellow or red wash. In the time of the second settlement a rude stone wall was built around the town. The debris of the two neolithic settlements is as much as 12 ft. in depth, implying a long period of accumulation. The neolithic population was succeeded by one of Semitic type, which introduced the use of metal, and buried its dead. The name of Amorite has been given to it, this being the name under which the Semitic population of Canaan was known to the Babylonians. Gezer was surrounded by a great wall of stone intersected by brick towers; at Lachish the Amorite wall was of crude brick, nearly 29 ft. in thickness (compare Deuteronomy 1:28). A "high-place" was erected at Gezer consisting of 9 monoliths, running from North to South, and surrounded by a platform of large stones. The second monolith has been polished by the kisses of the worshippers; the seventh was brought from a distance. Under the pavement of the sanctuary lay the bones of children, more rarely of adults, who had been sacrificed and sometimes burnt, and the remains deposited in jars. Similar evidences of human sacrifice were met with under the walls of houses both here and at Taanach and Megiddo. In the Israelite strata the food-bowl and lamp for lighting the dead in the other world are retained, but all trace of human sacrifice is gone. At Lachish in Israelite times the bowl and lamp were filled with sand. The second "Amorite" city at Gezer had a long existence. The high-place was enlarged, and an Egyptian of the age of the XIIth Dynasty was buried within its precincts. Egyptian scarabs of the XIIth and XIIIth Dynasties are now met with; these give place to scarabs of the Hyksos period, and finally to those of the XVIIIth Dynasty (1600 B.C.). Hittite painted pottery of Cappadocian type is also found in the later debris of the city as well as seal-cylinders of the Babylonian pattern. Meanwhile Canaan had for a time formed part of the Babylonian empire. Gudea, viceroy of Lagas under the kings of the Dynasty of Ur (2500 B.C. ), had brought "limestone" from the "land of the Amorites," alabaster from Mt. Lebanon, cedar-beams from Amanus, and golddust from the desert between Palestine and Egypt. A cadastral survey was drawn up about the same time by Uru-malik, "the governor of the land of the Amorites," the name by which Syria and Canaan were known to the Babylonians, and colonies of "Amorites" engaged in trade were settled in the cities of Babylonia. After the fall of the Dynasty of Ur, Babylonia was itself conquered by the Amorites who founded the dynasty to which Khammurabi, the Amraphel of Genesis 14:1, belonged (see HAMMURABI). In an inscription found near Diarbekir the only title given to Khammu-rabi is "king of the land of the Amorites." Babylonian now became the official, literary and commercial language of Canaan, and schools were established there in which the cuneiform script was taught. Canaanitish culture became wholly Babylonian; even its theology and gods were derived from Babylonia. The famous legal code of Khammu-rabi (see HAMMURABI, CODE OF) was enforced in Canaan as in other parts of the empire, and traces of its provisions are found in Gen. Abram's adoption of his slave Eliezer, Sarai's conduct to Hagar, and Rebekah's receipt of a dowry from the father of the bridegroom are examples of this. So, too, the sale of the cave of Machpelah was in accordance with the Babylonian legal forms of the Khammu-rabi age. The petty kings of Canaan paid tribute to their Babylonian suzerain, and Babylonian officials and "commerical travelers" (damgari) frequented the country. We must ascribe to this period the foundation of Jerusalem, which bears a Babylonian name (Uru-Salim, "the city of Salim"), and commanded the road to the naphtha springs of the Dead-Sea. Bitumen was one of the most important articles of Babylonian trade on account of its employment for building and lighting purposes, and seems to have been a government monopoly. Hence, the rebellion of the Canaanitish princes in the naphtha district (Genesis 14) was sufficiently serious to require a considerable force for its suppression. The Pharaohs of the XVIIIth Dynasty expelled the Hyksos and conquered Palestine and Syria. 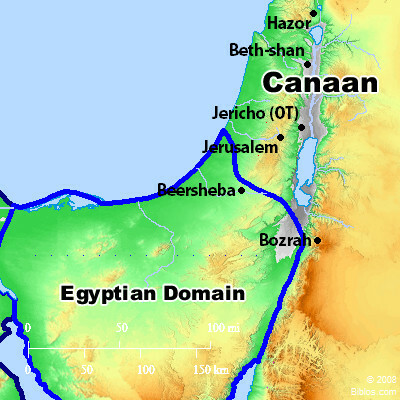 For about 200 years Canaan was an Egyptian province. With the Egyptian conquest the history of the second Amorite city at Gezer comes to an end. The old wall was partially destroyed, doubtless by Thothmes III (about 1480 B.C.). A third Amorite city now grew up, with a larger and stronger wall, 14 ft. thick. The houses built on the site of the towers of the first wall were filled with scarabs and other relics of the reign of Amon-hotep III (1440 B.C.). At Lachish the ruins of the third city were full of similar remains, and among them was a cuneiform tablet referring to a governor of Lachish mentioned in the Tell el-Amarna Letters. At Taanach cuneiform tablets of the same age have been discovered, written by Canaanites to one another but all in the Babylonian script and language. In the Tell el-Amarna Letters we have a picture of Canaan at the moment when the Asiatic empire of Egypt was breaking up through the religious and social troubles that marked the reign of Amon-hotep IV. The Hittites were attacking it in the North; in the South of Canaan the Khabiri or "confederate" bands of free-lances were acquiring principalities for themselves. The petty kings and governors had foreign troops in their pay with which they fought one against the other; and their mercenaries readily transferred their allegiance from one paymaster to another, or seized the city they were engaged to defend. Hittites, Mitannians from Mesopotamia, and other foreigners appear as governors of the towns; the Egyptian government was too weak to depose them and was content if they professed themselves loyal. At times the Canaanitish princes intrigued with the Assyrians against their Egyptian masters; at other times with the Mitannians of "Aram-Naharaim" or the Hittites of Cappadocia. The troops sent by the Egyptian Pharaoh were insufficient to suppress the rebellion, and the authority of the Egyptian commissioners grew less and less. Eventually the king of the Amorites was compelled to pass openly over to the Hittite king, and Canaan was lost to the Pharaohs. Gaza and the neighboring towns, however, still remained in their hands, and with the recovery of Egyptian power under the XIXth Dynasty allowed Seti I to march once more into Canaan and reduce it again to subjection. In spite of Hittite attacks the country on both sides of the Jordan acknowledged the rule of Seti and his son Ramses II, and in the 21st year of the latter Pharaoh the long war with the Hittites came to an end, a treaty being made which fixed the Egyptian frontier pretty much where the Israelite frontier afterward ran. A work, known as The Travels of the Mohar, which satirizes the misadventures of a tourist in Canaan, gives a picture of Canaan in the days of Ramses II. With the death of Ramses II Egyptian rule in Palestine came finally to an end. The Philistines drove the Egyptian garrisons from the cities which commanded the military road through Canaan, and the long war with the Hittites exhausted the inland towns, so that they made but a feeble resistance to the Israelites who assailed them shortly afterward. The Egyptians, however, never relinquished their claim to be masters of Canaan, and when the Philistines power had been overthrown by David we find the Egyptian king again marching northward and capturing Gezer (1 Kings 9:16). Meanwhile the counry had become to a large extent Israelite. In the earlier days of the Israelite invasion the Canaanitish towns had been destroyed and the people massacred; later the two peoples intermarried, and a mixed race was the result. The portraits accompanying the names of the places taken by Shishak in southern Palestine have Amorite features, and the modern fellahin of Palestine are Canaanite rather than Jewish in type. Canaanitish culture was based on that of Babylonia, and begins with the introduction of the use of copper and bronze. When Canaan became a Babylonian province, it naturally shared in the civilization of the ruling power. The religious beliefs and deities of Babylonia were superimposed upon those of the primitive Canaanite. The local Baal or "lord" of the soil made way for the "lord of heaven," the Sun-god of the Babylonians. The "high-place" gradually became a temple built after a Babylonian fashion. The sacred stone, once the supreme object of Canaanitish worship, was transformed into a Beth-el or shrine of an indwelling god. The gods and goddesses of Babylonia migrated to Canaan; places received their names from Nebo or Nin-ip; Hadad became Amurru "the Amorite god"; Ishtar passed into Ashtoreth, and Asirtu, the female counterpart of Asir, the national god of Assyria, became Asherah, while her sanctuary, which in Assyria was a temple, was identified in Canaan with the old fetish of an upright stone or log. But human sacrifice, and more especially the sacrifice of the firstborn son, of which we find few traces in Babylonia, continued to be practiced with undiminished frequency until, as we learn from the excavations, the Israelite conquest brought about its suppression. The human victim is also absent from the later sacrificial tariffs of Carthage and Marseilles, its place being taken in them by the ram. According to these tariffs the sacrifices and offerings were of two kinds, the zau`at or sin offering and the shelem or thank-offering. The sin offering was given wholly to the god; part of the thank-offering would be taken by the offerer. Birds which were not allowed as a sin offering might constitute a thank-offering. Besides the sacrifices, there were also offerings of corn, wine, fruit and oil. What primitive Canaanitish art was like may be seen from the rude sculptures in the Wadi el-Kana near Tyre. Under Babylonian influence it rapidly developed. Among the Canaanite spoil captured by Thothmes III were tables, chairs and staves of cedar and ebony inlaid with gold or simply gilded, richly embroidered robes, chariots chased with silver, iron tent poles studded with precious stones, "bowls with goats' heads on them, and one with a lion's head, the workmanship of the land of Zahi" (the Phoenician coast), iron armor with gold inlay, and rings of gold and silver that were used as money. At Taanach, gold and silver ornaments have been found of high artistic merit. To the Israelites, fresh from the desert, the life of the wealthy Canaanite would have appeared luxurious in the extreme. The position of Canaan made it the meeting-place of the commercial routes of the ancient world. The fleets of the Phoenician cities are celebrated in the Tell el-Amarna Letters, and it is probable that they were already engaged in the purple trade. The inland towns of Canaan depended not only on agriculture but also on a carrying trade: caravans as well as "commercial travelers" (damgari) came to them from Cappadocia, Babylonia and Egypt. Bronze, silver, lead, and painted ware were brought from Asia Minor, together with horses; naphtha was exported to Babylonia in return for embroidered stuffs; copper came from Cyprus, richly chased vessels of the precious metals from Crete and corn from Egypt. Baltic amber has been found at Lachish, where a furnace with iron slag, discovered in the third Amorite city, shows that the native iron was worked before the age of the Israelite conquest. The manufacture of glass goes back to the same epoch. As far back as 2500 B.C., alabaster and limestone had been sent to Babylonia from the quarries of the Lebanon. Long before the age of Abraham the Babylonian seal-cylinder had become known and been imitated in Syria and Canaan. But it was not until Canaan had been made a Babylonian province under the Khammu-rabi dynasty that the cuneiform system of writing was introduced together with the Babylonian language and literature. Henceforward, schools were established and libraries or archive-chambers formed where the foreign language and its complicated syllabary could be taught and stored. In the Mosaic age the Taanach tablets show that the inhabitants of a small country town could correspond with one another on local matters in the foreign language and script, and two of the Tell el-Amarna letters are from a Canaanitish lady. The official notices of the name by which each year was known in Babylonia were sent to Canaan as to other provinces of the Babylonian empire in the cuneiform script; one of these, dated in the reign of Khammurabi's successor, has been found in the Lebanon. H. Vincent, Canaan d'apres l'exploration recente, 1907; G. A. Smith, Historical Geography of the Holy Land, 1894; Publications of the Palestine Exploration Fund; E. Sellin, Tell Ta`annek and Eine Nachlese auf dem Tell Ta`annek, 1904-5; Schumacher, Tell Mutesellim, 1909; Thiersch, Die neueren Ausgrabungen in Palestina, 1908. See, further, ARKITE; ARVADITES; BAAL; GIRGASHITE; HITTITES; HIVITE; JEBUSITE; KADMONITE; KENIZZITE; PALESTINE; PERIZZITE; REPHAIM; SINITES; TEMAN.